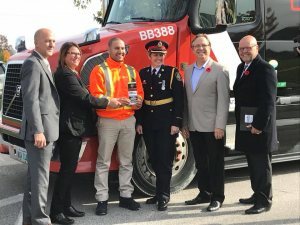 Cargo theft continues to be a major concern in the trucking industry and Halton Crime Stoppers is mounting a campaign with other Crime Stoppers programs to identify some of the people responsible for these heists. This is an extremely lucrative crime which nets criminals an estimated $5 billion a year, according to a news release from Crime Stoppers of Halton. At least one trailer load of goods is stolen every day with the cargo ranging from high priced electronics, alcohol or food products to candy, furniture and toilet paper. The Halton Regional Police Service in conjunction with Crime Stoppers want to raise the public’s awareness on this rising trend of organized cargo theft. Cargo theft has become a widespread and major challenge for transportation companies, the Insurance Bureau of Canada and GTA police agencies. The repercussions from these thefts ultimately impacts all of us from the rising cost of insurance premiums to the price of merchandise on the shelves. Criminals are drawn to cargo crime because of the perceived low risk and high reward. However, profits from cargo theft fuel a wide array of criminal activity including incidents of homicide. It’s definitely not a victimless crime. 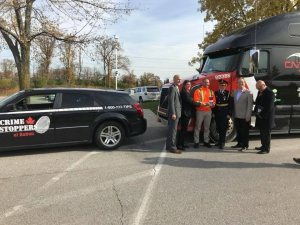 The awareness program being undertaken by various Crime Stoppers programs is designed to alert trucking companies and tractor trailer drivers along Canada’s busiest transportation routes – Highway 401 and the Queen Elizabeth Way – that cargo theft continues to be a concern. A promotional flyer that can be hung on the vehicle’s rear view mirror tells drivers how to contact the Crime Stoppers anonymous tip line if they have any information about cargo thefts or individuals responsible for these crimes. The most commonly stolen goods are food and beverage products, along with household cleaning items which are then sold by organized crime groups through a thriving black market industry although some are sold to unsuspecting owners of Mom and Pop stores. Most cargo thefts occur from secure trucking compounds, warehouse sites and parking lots, mainly when tractor trailers are left overnight. However, there have been a small number of occurrences across North America where rigs are hijacked and drivers seriously hurt or killed when organized crime groups are specifically targeting vehicles carrying cigarettes, alcohol or pharmaceuticals for distribution by traffickers. The Federal Bureau of Investigation have described cargo theft in the U.S. as a “gateway” crime with proceeds funding organized crime activity including drug trafficking and potential terrorism. 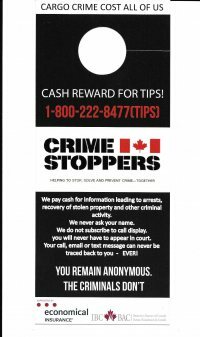 Also supporting the Crime Stoppers effort to create awareness of this crime is Economical Insurance and the Insurance Bureau of Canada who have provided funds for the promotional material.